I feel that the best phonics programs for homeschooling should be easy for the parent to use and interesting for the child. The program should be inexpensive. I also like programs that use Bible stories to teach reading. Most educators believe that phonics is the way to teach children who have learning disabilities. The best reading curriculum for children who have disabilities uses a multi-sensory approach. The child should see the letter, say the sound, and trace the letter. Our favorite phonics program was 1- 2-3 Read published by Alpha Omega. The program goes over the sounds of the alphabet, blending short sounds together. 1-2-3 Read has a song that teaches the letter sounds. Also for each letter your child will make a paper sack puppet. When your child is able to blend letters together he is ready to read the stories in Bible Stories for Early Readers. The Bible stories are phonically correct. The stories do not use a lot of sight words. Each book adds more words. The readers supplement 1-2-3 Read. For our family 1- 2-3, Read and the Early Readers was the best phonics program. We have also used a computer programs called Color Phonics. The program shows pictures of how to make the letter sounds with your mouth. It also color codes the vowel sounds. Words with the short a sound are tan. The long a sound is colored gray. The program has a lot of detail. It would be good for someone who did not speak English. We felt that the program moved too slowly. Some homeschoolers are successful with Teach Your child to Read in 100 Easy Lesson. Teach your Child to Read in 100 Easy Lesson is a scripted book that teaches your child to read. Each lesson takes about 20 minutes. My children did not like the stories. Others use Hooked on Phonics. With Hooked on Phonics children learn at their own rate. They have to master a new skill before moving on. The program uses games and books to reinforce new knowledge. I had heard that Hooked on Phonics was good, but at the time I could not afford it. I have used Zoo Phonics in a school setting. My students liked the program and learned the sounds. Zoo Phonics uses pictures, sound, and body movements to teach the letter sounds. There are other programs. Some have been around for years others are new. One of the new programs that I have heard about is Children Learning Reading. It seems like it is very similar to 1, 2, 3 Read. Although, it does not use music or crafts, Children Learning Reading does teach phonics in a systematic way. It does not use Bible stories but does use nursery rhymes. It is a downloadable program so you don’t have to wait for shipping. You don’t need to spend a lot of money to teach your child how to read. You can even teach your child with items in your home. To teach beginning phonics, ask questions about favorite items. If you have a cat ask, "Can you hear the /c/ sound in cat?" Have your child find other items that sound like cat. When you are reading to your child, point out words that sound like cat. Begin to teach your child the shapes of the letters. When he knows the sounds of some consonants and a vowel then he can start blending them together. You can write the letters on pieces of cardstock. Show him how to combine the letters. Sound out the words. Ruth Beechick has written a short book called A Home Start in Reading. The book has more ideas for teaching your child how to read. Another phonic website is Foniks. When you click on a pink word the computer will say the sound and read the word. 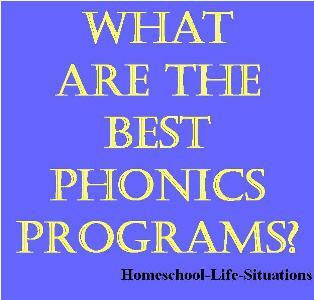 It is hard to recommend the best phonics programs for homeschool because each child is different. Some learn to read easily. Other children struggle with reading. Some children are bored with the simple beginner readers. Other children are excited that they are beginning to read. Just remember that most children learn to read in their time.